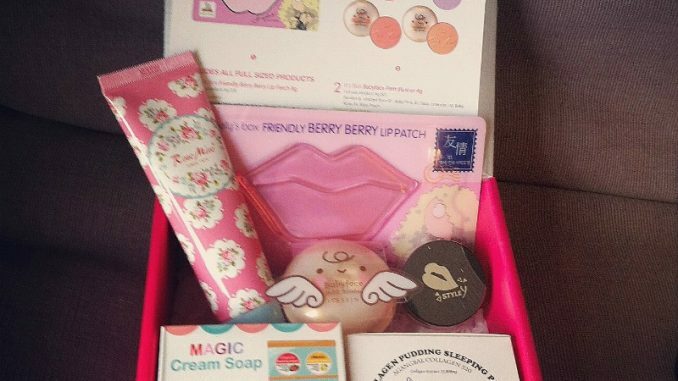 This is the other Memebox that arrived today, My Cute Wishlist 2. I bought it with OMG2 in an express bundle, so it only took two days to ship to the UK. Standard Memebox shipping seems to have slowed down lately, so these bundle deals are worth utilising if you don’t want to have to wait too long. Whilst I like OMG2 much more than OMG1, I can’t say the same about Cute Wishlist 2. My Cute Wishlist 1 was a total treasure trove of adorableness, but with box 2, whilst there are some potential treasures in there, I feel it’s a bit lacking on the cute factor. And after all, that’s the whole point of the box. It’s a bit like sending an OMG box with no OMG factor. Oh wait, they already did that. Don’t get me wrong, it’s still a nice box to receive. But it’s also a TINY box. That’s not the kind of cute I like. My Cute Wishlist 2 contains 6 full size products, with a box value of $84 which is definitely on the low side for a supposed-Superbox. It retailed at $23 plus shipping. I have a feeling I paid a bit less due to discounts. We’re seeing a lot of the Sally’s Box brand in Memeboxes, and whilst I like their facial masks a lot, my experience is that lip masks like this don’t tend to do a lot. I’ll try it though, you never know. The most genuinely cute thing in the box, a lovely little powder puff blush. Didn’t they just send out a bunch of hand creams? Quite floral scent in a Cath Kidston-style package. This cleanser was in the Cacao box and I found it quite drying, though my daughter likes it. To be fair, the pig on this packaging is a cute little fellow. But does that mean it contains pig collagen? The packaging and information leaflet don’t give much away. Will have to investigate further. Provided there’s no actual piggy included, I like this. Sleeping packs are heavy duty night time treatments for people who don’t mind having a slimy face and sticking to the pillow. Three varieties, I got strawberry. I also got another strawberry lip balm from Memebox about a week ago. They should call this the Doubles box. I think that if Cute 1 hadn’t been so good then this wouldn’t feel like so much of a let down. Cute is a hard theme to get wrong in Korean cosmetics but if there’s one thing we can say about Memebox, they are never predictable. Although one thing I have found is that sometimes boxes that look a bit disappointing on first opening can turn out to be great once you start using the products. And it’s still way better than any of the beauty boxes currently available in the UK. Apparently these Cute boxes are due to be a regular monthly theme. I have already ordered Cute 3 but I think that will be my last. Other than that, the best tip I can give you if you’re thinking of buying a Memebox is that the boxes built around an ingredient seem to be consistently better than those built around a theme. So bear that in mind when you’re browsing the current boxes.